This past weekend, the Ahwatukee Foothills News, a local Phoenix newspaper, published one of my articles in their Sunday edition. 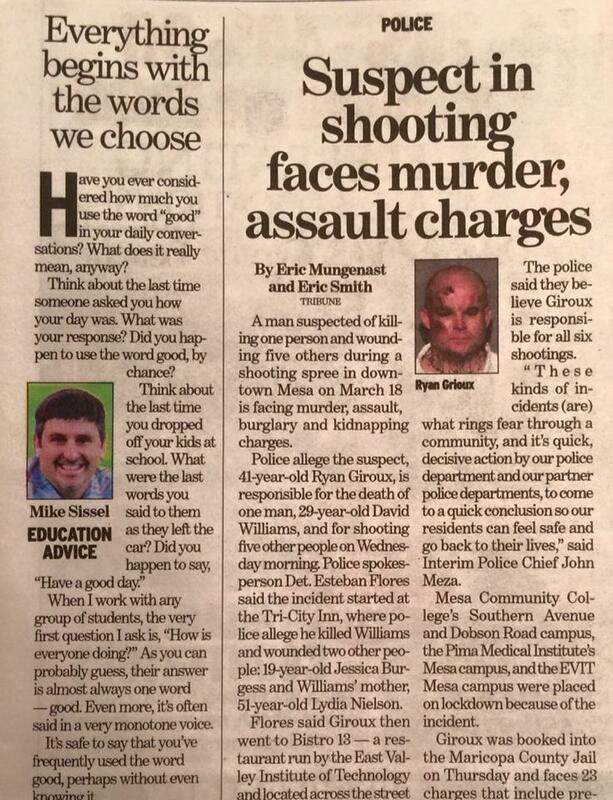 In a bit of irony, the story of Ryan Grioux (whose deadly rampage in Mesa, Arizona was breaking news throughout the country) was right next to mine. In order to appreciate this irony, let me take you back in time a little. Flashback to 1999 and I had just finished presenting my leadership thesis, which served as the culmination of my master’s degree from Willamette University in Salem, Oregon. Not surprisingly, my thesis outlined the need for quality character education programs in all schools. With the Columbine shootings still fresh in everyone’s minds, I made the argument that perhaps a quality character education program could have prevented something like this from happening. Feeling confident that my message had landed, I walked proudly back to my seat where my professor’s critique was waiting for me. The reviews were positive for the most part, but it’s her final comment that has remained etched in my memory forever. Fast forward back to today and while that single comment could’ve very easily deflated my passion for character development, I chose to use it as fuel to move in a direction of positive change. You see, I don’t know for certain whether or not my content will prevent students from following the path Ryan Grioux chose, but here’s what I do know. The skills of self-awareness and self-management are tools that, when used effectively, can literally change the trajectory of someone’s life. Call me naïve, but would Ryan Grioux’s life path look different had he received these skills at an early age? I don’t claim to know all of the factors that contributed to his horrific choice, but it’s clear that his thoughts were destructive in nature. These negative thought patterns didn’t happen overnight. They’ve likely been marinating in his mind for years. I can’t help but look at the students I work with today and wonder which of them are beginning to plant seeds of thought that could perhaps manifest in the same destructive patterns. Whatever is repressed gets expressed. Unfortunately, talking about emotions and feelings is somewhat of a taboo topic for most people. We are conditioned to believe that we must maintain a certain level of toughness or bravado (boys especially). Therefore, expressing our emotions greatly compromises this tough image. What happens when you open a can of soda after shaking it? It explodes. Well, the same is true for our emotions. Each time we repress an emotion, it’s as if we are shaking the can of emotions. Without proper emotional management techniques, it’s only a matter of time before the repressed emotions are expressed, often in ways that we regret. The only way to remove darkness is by shining a light. The media has a tendency to highlight all of the darkness in the world, which promotes increased levels of fear and anxiety in the minds of those watching. This often leads to people talking about problems, instead of looking for solutions. I believe that the best way to change other people is by changing ourselves. You see, if we continue to shine our lights on the world, we have the potential to remove the darkness not by force, but by influence. I will never know for certain if my teachings will prevent horrific human behaviors in the future, but that isn’t going to stop me from trying. Please don’t let it stop you, either. Keep shining your light. Thanks Bill. I’m blessed to have great mentors like yourself who have paved the way.